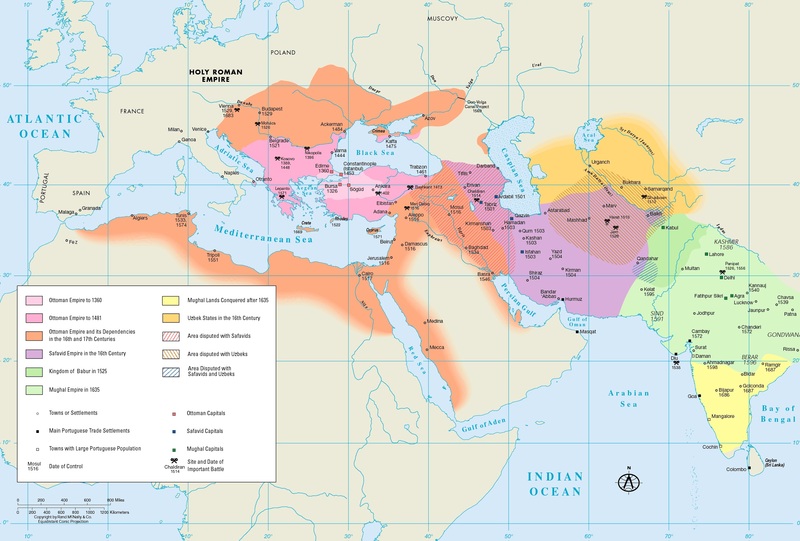 1- When the Sephardim appeared in world history? The answer: immediately after the Turkic invasion and enslavement of North Africa under their false flags of Islam, and Arab imperialism. 2- From where the Sephardim came to the Iberian Peninsula? The answer: from Turkey via North Africa. 3- To where the Sephardim went after their expulsion from the Iberian Peninsula in 1492? The answer: to Turkey and North Africa. 4- Who helped the Sephardim most after their expulsion from the Iberian Peninsula in 1492? The answer: the Turkic Ottoman Empire. 5- How the Sephardim lived in before, during and after their stay in the Iberian Peninsula? The answer: in Turkic invasions, occupation and slavery, money, prostitution businesses in Iberia and all Africa. 6- How their language, Ladino, is related to other languages? The answer: many borrowings from Turkish and to a lesser extent from Greek, Arabic, Hebrew, and French. 7- What are the results of the Genetic studies of the Sephardim? The answer: The Turks are all over the world and their genetic are heavily mixed like no other nation despite the claims of Jewish marriage rules; but still they resemble other Turkic groups. This is yet another strong evidence that almost all Jews in the World are not Semitic at all; and they are originally from central Asia and not the Levant. The creation of the State of Israel is the work of Turkic peoples under the leadership of Turkey and the Turkic ruling elites in the Gulf Arab states. 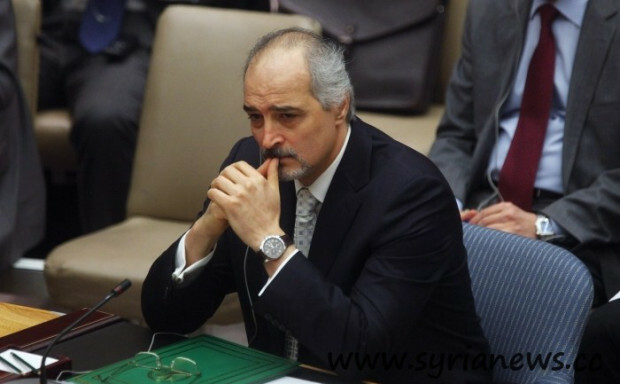 Below is a very interesting recent series of statements, followed by Q&A with Syria’s Ambassador to the UN, Dr. Bashar al-Ja’afari on turkey’s latest criminal aggression against Syria, as well as turkey’s history of violating Syria’s sovereignty and abetting, funneling terrorists into Syria. “Nowadays everybody knows what’s going on in Syria. The turkish government is responsible of dealing, trading with ISIL. Buying oil, gas, and artifacts from ISIL. Facilitating the movement of this illegal, illegitimate trade of artifacts and gas and oil through turkish territory into some european capitals and ‘israel’. Important Update Notice on 24 July 2018: I have updated my Abyssinian Hypothesis after discovering the that single-hump camel (The dromedary) was unknown in Arabia, Aram, Assyria, and Kemet before 950 BC, while in abundance in the land of Punt. 5- The Lost Sheep of the House of Israel are those Israelite who left the land of Punt and decided to collaborate with Turkic Mongolians to invent Judaism and colonize Aramaic lands; and turned into Hebrew Israelite. Therefore, the Israelite Exodus of 1446 BC was only within Punt, from one region to another. 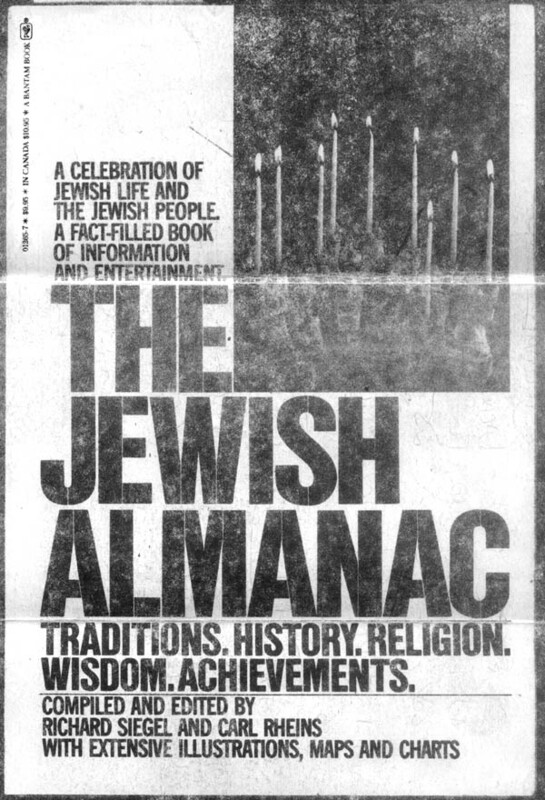 The Jews are not Israelite at all; and the name Judah was just used deceptively to relate the Jews to the Israelite. The Israelite were scattered all over the world and they no longer exist as a nation or a tribe. Yiddish was the everyday language of most Jews in Eastern Europe (Poland, Russia, Lithuania, Latvia, Romania, and parts of Hungary and Czechoslovakia) for 1,000 years. The term “Yiddish” is derived from the German word for “Jewish.” The most accepted (but not the only) theory of the origin of Yiddish is that it began to take shape by the 10th century as Jews from France and Italy migrated to the Rhine Valley. They developed a language that included elements of Hebrew, and French, Italian, and German dialects. 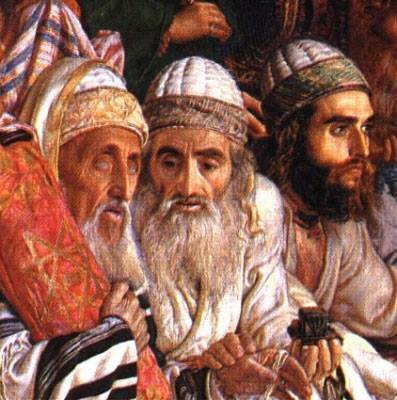 In the late middle Ages, when Jews settled in Eastern Europe, Slavic elements were incorporated into Yiddish. In linguistics, mutual intelligibility is a relationship between languages or dialects in which speakers of different but related varieties can readily understand each other without intentional study or special effort. As for: Azerbaijani, Crimean Tatar, Gagauz, Turkish and Urum (partially and asymmetrically and also for: German and Yiddish language is clearly was made by the Khazar Ashkenazim Jews in Germany in the same way which they produced. The Judeo-Spanish language is commonly referred to as Ladino. Ladino is a language derived from medieval Spanish, with influences from other languages such as Aragonese, Astur-Leonese, Catalan, Galician-Portuguese, and Mozarabic. Ladino also has vocabulary from Ottoman Turkish, Hebrew, Aramaic and Arabic, French, Italian, Greek, Bulgarian and Serbo-Croatian. The Turkish government promoted Turkish language and suppressed the Kurdish language. Ladino was not suppressed, but according to scholars, the community itself helped to suppress it. The Sephardim Are Also Turkic Just Like the Ashkenazim. Sephardim Jews, also known as Sephardic Jews or simply Sephardim “The Jews of Spain”, are a Jewish ethnic division whose ethno-genesis and emergence as a distinct community of Jews coalesced in the Iberian Peninsula around the start of the 2nd millennium (i.e., about the year 1000). The Sephardim established communities throughout Spain and Portugal, where they traditionally resided; evolving what would become their distinctive characteristics and diasporic identity. Their millennial residence as an open and organized Jewish community in Iberia was brought to an end starting with the Alhambra Decree by Spain’s Catholic Monarchs in the late 15th century, which resulted in a combination of internal and external migrations, mass conversions and executions. 2- From where the Sephardim came to the Iberian Peninsula? The answer: from Turkey and other Turkic colonies via North Africa. 3- To where the Sephardim went after their expulsion from the Iberian Peninsula in 1492? The answer: mainly to Turkey and North Africa; and some went to Western Europe. 4- Who helped the Sephardim most after their expulsion from the Iberian Peninsula in 1492? The answer: only the Turkic Ottoman Empire. This is yet strong evidence that almost all Jews in the World are not Semitic at all; and they are originally from central Asia and not the Levant. The creation of the State of Israel is the work of Turkic peoples under the leadership of Turkey and the Turkic ruling elites in the Gulf Arab states. 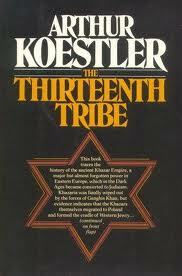 New Genetic Research Confirms Koestler’s “Khazar” Theory! Ashkenazi Jews Are Not The Jews of The Bible! In 2012, a major genetic study of Ashkenazim was led by Johns Hopkins geneticist Eran Israeli-Elhaik. It concentrates on the compelling genetic evidence that eastern European Jewry’s roots are not just in the Mid-East but, perhaps even more so, in the Caucasus, the mountainous heartland of ancient Khazaria. (See “The Missing Link of Jewish European Ancestry: Contrasting the Rhineland and the Khazarian Hypotheses“). Research Article “The Missing Link of Jewish European Ancestry: Contrasting the Rhineland and the Khazarian Hypotheses” by Eran Israeli-Elhaik, Department of Mental Health, Johns Hopkins University Bloomberg School of Public Health, Baltimore, MD, USA, 21208. McKusick-Nathans Institute of Genetic Medicine, Johns Hopkins University School of Medicine, Baltimore, MD, USA, 21208. Conclusions: We compared two genetic models for European Jewish ancestry depicting a mixed Khazarian-European-Middle Eastern and sole Middle Eastern origins. Contemporary populations were used as surrogate to the ancient Khazars and Judeans, and their relatedness to European Jews was compared over a comprehensive set of genetic analyses. Our findings support the Khazarian Hypothesis depicting a large Caucasus ancestry along with Southern European, Middle Eastern, and Eastern European ancestries, in agreement with recent studies and oral and written traditions. So it is clear that there is no political difference between Israel and Turkey. But only that Israel is the place for elite Turks. 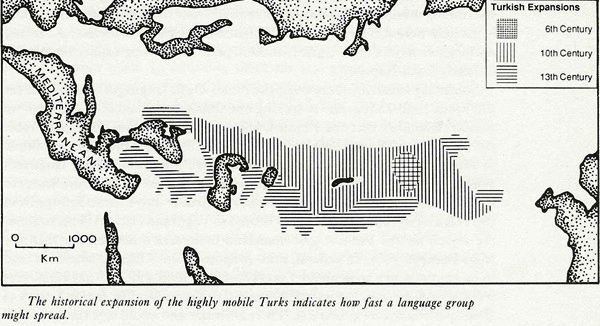 The Turks are all over the region and especially in elite families in the Gulf Arab oil states and in North Africa. Israel is a very small part of the Turkic picture only. They have mutual gains with the governments in USA and Europe and that is why they are allies. is this another proof that the Ashkenazi Jews are not Semites and they are Asian Turkic? If so then Anti-Semitism is actually Anti-Turkism. It is getting clearer by the day that secret societies are actually representing just only one group of people with different nationalities and religions. All of them have Turkic Khazar blood. These people are the elite families in the Gulf Arab Muslim oil-doms, Zionist non-Semite Jewish Israelis, ruling Turks in Islamist Turkey, and the big Ashkenazim and Sephardim bankers and main corporations in the Christian and secular US and Europe. The elite families in the Gulf Arab oil-doms they are not Arabs and were not made by Arabs. 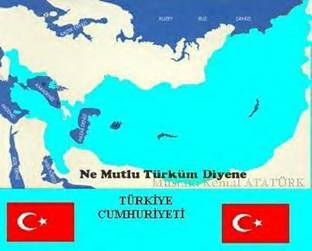 Turkey and Israel are two faces for the same coin that is the Turkic peoples. It is convincing and very important to understand that the Jewish problem is actually a bad misrepresentation of the Turkic problem. This old misconception is not only damaging Iran, Russia, Germany but also all Europe and even the true Israelite and the whole world without exception. The Turkic Khazars split into both Ashkenazim and Sephardim and other smaller groups. Hitler and the Nazi were against the Khazar Ashkenazi m in Germany and in the Slavic Eastern Europe. It is impossible to tell if Hitler knew that they are not Semites and definitely not Israelite, but only new Asian pretentious converts. So Hitler was actually not Anti-Semitic or Anti Slavic but Anti Turkic, even if it was apparent to him; because those Jews of Germany and Europe and the USA are not Semitic but Turkic. Once the world identifies their origin and history it would be much easier to consolidate the lines and strengthen the international support from the Americas up to Russia and Japan including Africa and Asia. The acts of the Turks and Ottomans are well known in Anatolia, Caucasus, Greece, the Balkan, North Africa, the rest of Africa, Arab countries, and even India and China. Telling the truth shall not be labeled anti-Semitic. Those known as capitalists or communists who claim to be Jews, Muslims, and Christians in Israel, Arabia, Anatolia, Europe and USA are barricading behind fake religions, history and ideologies. It is necessary to dismantle their covers first. This is to explain that, after decades of media brainwash, it is difficult to discover that the devastation of Communism, Capitalism, and fabricated religions. Such degenerating ideas were threatening the Germans, and that is why they created Nazism to avoid the terrible fate of Russia and of all Europe. They worked hard to protect themselves and Europe from the Turkic people who called themselves Jews. The original Semitic Israeli nation was shocked and was terrified and the Turkic Khazar Jews manipulated this situation for their interests. Calling Hitler’s and Nazi’s actions against Turkic Khazar Jews as Anti-Semitism is ironic since the Khazar Ashkenazi Jews are not Semites at all. The Ashkenazim as well as the Sephardim are systematically trying to deny that their true origin and the origin of their Yiddish and Ladino Languages are from Turkic Khazar. They both claim that their Zionist ambitions and businesses are legitimate, nationalistic and religious. What is pan-Turanianism? Simply put, pan-Turanianism is an ideology that aims at creating a Turkic super state stretching from the Balkans in Europe, eastwards across Turkey, Iran (Persia), the Caucasus, Central Asia up to and including northwest China. 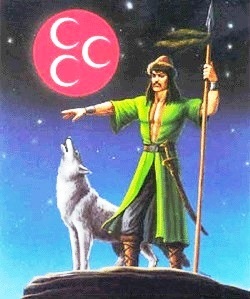 The logic behind this is that all people who speak Turkish must be incorporated into this Turkic super state. Hungarian pan-Turanianist activists go even further. They have proposed that the entire Eurasian landmass between Hungary and Norway in Europe to Japan and Korea was once an empire known as “Turania”. Apart from non-scholastic websites, no linguistic, anthropological and archeological evidence for such an empire exists. Pan-Turanian racialists and historians would beg to differ. They are impervious to logical explanations even in the face of hard evidence. Such is the case of all who are infected with the virulent virus of racialism. Pan-Turanianism, like Nazi “racial sciences”, or Stalinist “History”, has failed to convince the majority of western scholarship to its cause, and has been as equally unsuccessful in Eastern Europe, with the exception of Hungary and the Republic of Azerbaijan. Much of pan-Turanian ideology is similar to pan-Germanic racism and Nazism; philosophies from which the Grey Wolves and pan-Turanian ideologues have drawn much of their inspiration (see Parts III & IV). 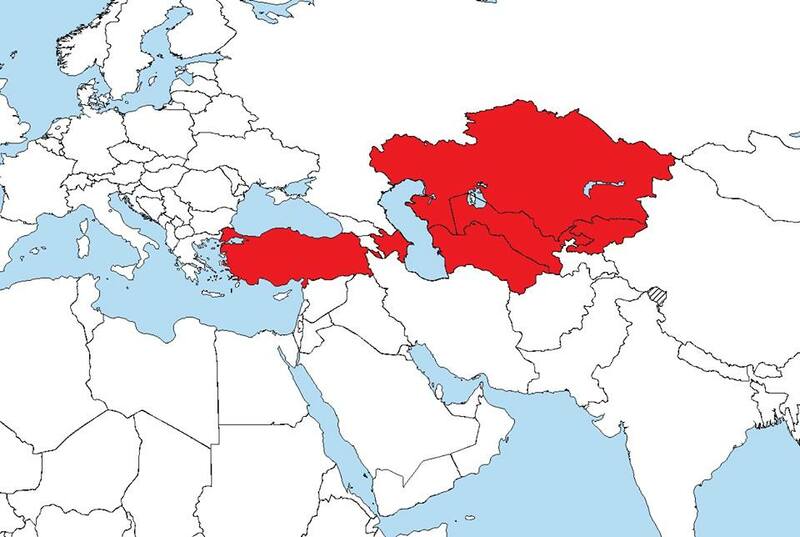 Like the Nazis in the 1930s and 1940s, the pan Turanian Turks envision their Turan super-state (like the Nazi “Germania”), in terms of “lebensraum” (German for “living space”) for all Turkic speaking peoples. The late president of the Republic of Azerbaijan, Abulfazl Elchibey (1938-2000), a Grey Wolf sympathizer himself (see Part II, item 4), is reputed to have stated that “…the road to Turkistan runs through Tabriz”. Tabriz has been an integral part of Persia for thousands of years. Pan-Turanianism is perhaps one of the last racialist movements that first began in the 19th century. Traditional history cites its early origins amongst Ottoman officers and intelligentsia studying and residing in 1870s Imperial Germany. The fact that many Ottoman Turkish officials were becoming aware of their sense of “Turkishness” is beyond doubt of course, and the role of subsequent nationalists, such as Ziya Gokalp (see Part II, item 7a) is fully established historically. New Genetic Research Confirms Koestler’s “Khazar” Theory! Ashkenazi Jews Are Not The Jews of The Bible! Israel is the place for elite Turks but the Turks are all over the region and specially in ruling families in the Gulf Arab oil states and in north Africa. Israel is a very small part of the picture only. They have mutual gains with the governments in USA and Europe and that is why they are allies. I am not a fan of genetic testing for a simple reason. Unless you have the DNA of the 12 sons of Israel there is no way you can confirm with 100% certainty that people who call themselves Jews are the biological descendents of the 12 tribes of Israel. Ashkenazis are not the descendants of the Ancient Israelites! Sephardi Jews, also known as Sephardic Jews or simply Sephardim “The Jews of Spain”, are a Jewish ethnic division whose ethno-genesis and emergence as a distinct community of Jews coalesced in the Iberian Peninsula around the start of the 2nd millennium (i.e., about the year 1000). They established communities throughout Spain and Portugal, where they traditionally resided; evolving what would become their distinctive characteristics and diasporic identity. Their millennial residence as an open and organized Jewish community in Iberia was brought to an end starting with the Alhambra Decree by Spain’s Catholic Monarchs in the late 15th century, which resulted in a combination of internal and external migrations, mass conversions and executions. Pakistan Defence Forum posted the following article Discussion in ‘Military History & Tactics’ started by atatwolf, on Nov 28, 2013. What is your favorite Turkic Muslim Empire? Hopefully the Turkic peoples who are left will learn from the mistakes of their ancestors and don’t make the same mistake, which I’m sure off. 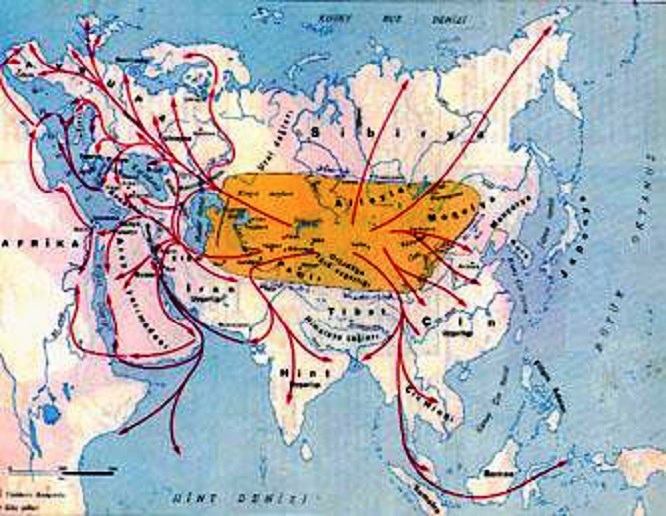 Turks populate the ancient silk road. There are a lot of resouces and a lot of commerce opportunities. These people are bound the raise. If you look at energy projects between Turkey-Azerbaijan-Turkmenistan-Kazakhstan you see big steps are being made for the future. All of these peoples are connected through history. Any way, I added a poll. Pick your favorite Empire. is this another proof that the Ashkenazi Jews are not Semites and they are Asian Turkic? If so then Antisemitism is actually Anti-turkism. Testing a female captive’s teeth in an eastern slave market. The horrors of the trans-Atlantic slave trade have left an ineradicable mark on history. In the course of a little more than three and a half centuries, 12.5 million prisoners – at least two-thirds of them men destined for a life of labour in the fields – were shipped from holding pens along the African coast to destinations ranging from Argentina in the south all the way north to Canada. It was the largest forced migration in modern history. The following quote is from a news article about former Auschwitz guards who will soon go on trial, charged with committing war crimes, due to their former work in Auschwitz, a so-called Nazi death camp. Two former SS men will go on trial this month for their alleged complicity in the murder of thousands of people at Auschwitz, as Germany accelerates its bid to prosecute ageing Third Reich criminals. Reinhold Hanning, 93, faces court in the western town of Detmold from Thursday, charged with at least 170,000 counts of accessory to murder in his role as a former guard at the camp in occupied Poland. Hubert Zafke, 95, will have to answer at least 3,681 counts of complicity in killings in separate proceedings in the eastern town of Neubrandenburg from Feb. 29.